Peaches crossed to the Rainbrow Bridge in July 2016 so there are now no Salukis at Ridgesetter. Although only owning Salukis since 2000, we've had a long involvement with the breed - as steward, CC Rep, videoing shows and serving on the NSW Club Committee. Currently, in residence, is Peaches - CH PADTHEWAY N CHANT. Peaches spends the majority of her inside time gracing one of the various lounge chairs and when outside, in her favourite position on top of our spa where she surveys the yard and other dogs. Peaches came to us as a rehouse and she has fitted in wonderfully. She causes us no problems whatsever and is a pleasure to live with. Peaches has a wonderful philosophy on dogs shows. Until early this year, our 'lounge lizard' went out begrudginly only a few times each year for major shows where she strutted her stuff, usually achieved a good win, then came back home to take up where she left off. Unfortunately, a freak accident caused a serious broken tail and whilst the vets did everything possible, the break didn't heal and we had to dock her tail. Peaches is now really happy as that means she doesn't have to get off the lounge chair at all! We also have her son here, Quest - RIDGESETTER QUEST FOR SUCCESS. Quest and his brother Kaos, out of Matrix (Grand Champion Padtheway Schiram Qatar), were the only two surviving pups from Peaches emergency caesarian operation in 2009. Kaos was born here at home, but had to be assisted to get going. Quest was the first pup out at the vets and took quite some time to be able to breathe on his own. Sadly, the rest of the litter didn't make it. Quest went to live with a close friend but following a house fire, he came back here. He's a big boy but very soft. He loves playing games with the whippets but needs to watch where he's running. We've lost a few citrus trees that he's run into! Kaos (red) is in a wonderful home in Sydney where he is a much loved companion. Quest (black) is shown sparingly as he what we term a very raw youngster. 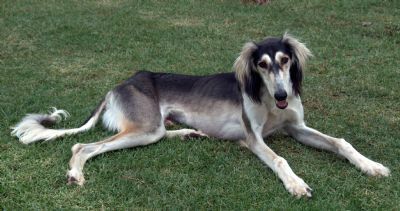 He has lovely angles, a super front, a gorgeous expression with typical Saluki eyes. We are battling to get weight on him (I think it just goes into his legs), and he needs to grow up a little mentally as well. He's very relaxed and a little lazy but I believe and hope, with time, he'll grow up into a stunning dog. His feathering is growing every day. 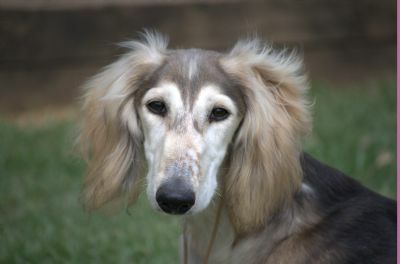 If you are considering a Saluki, don't be worried by the feathering. Peaches and Quest run with the RR's and Whippets and once a week we easily remove any debris collected in her feathering.